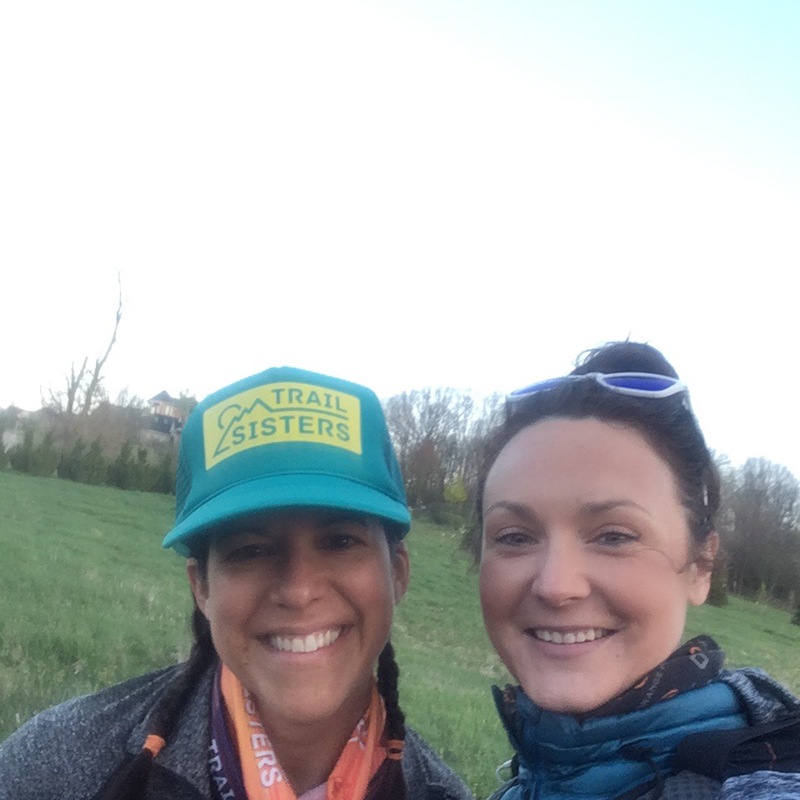 I have looked forward to the Apple Creek 50K since I signed up many, many months ago…not because I’ve heard the course is beautiful (it is) or that the volunteers are awesome (they are), but because I was going to get to hang out with my good friend Allison! We met in person close to a year ago at the Cellcom Marathon and bonded instantly over the sufferfest we endured. She is beyond hilarious, sweet, and so much freaking fun to hang out with. 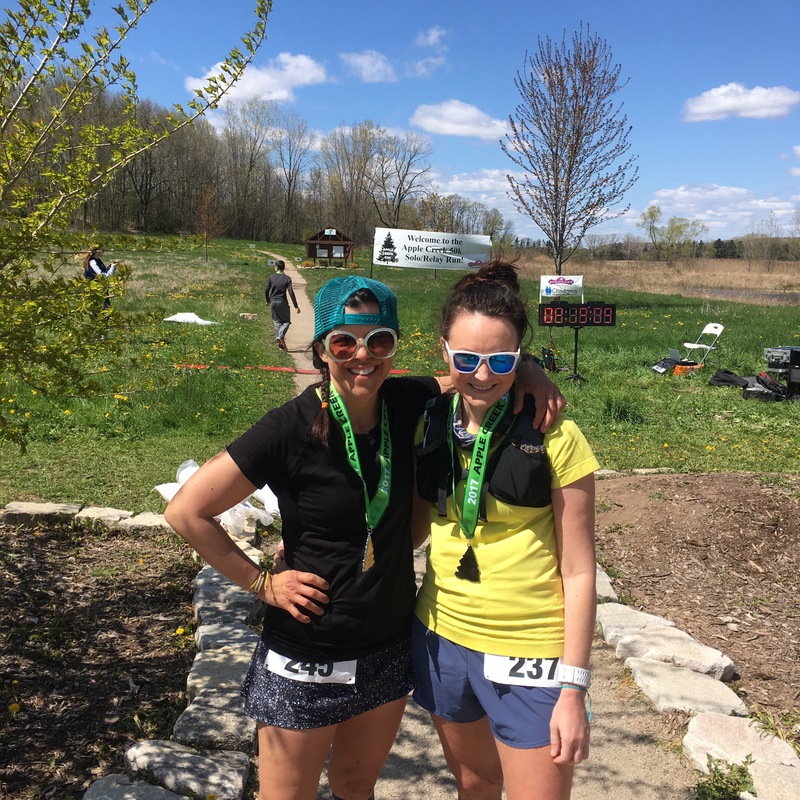 We had run the Northface Endurance WI 50k together in September 2016 and the Icebreaker Relay in January 2017 where began to plot out our next adventure. The 50k is a distance we both enjoy and it gives us lots of time to chat. Trail running is becoming my new favorite type of race and Allison is also a big fan. 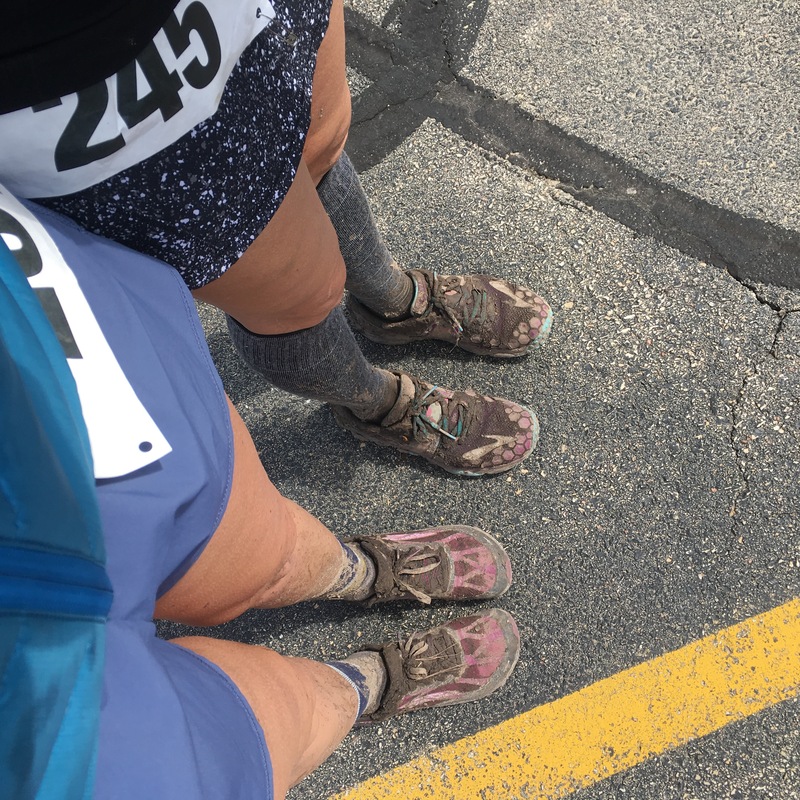 After hearing about the Apple Creek event and the amazing reason this race was organized a few years ago we knew we had found the perfect event to meet up for. Race morning snuck up on me. Allison and I had messaged back and forth all week about logistics (when to meet, what to wear, food, ect). The race was to start at 6am which meant I needed to leave about 4:15am to get to the event and grab my packet. We both arrived at the same time and headed to the packet pick up area. The air was chilly, but it was a perfect day for running – no wind, a little cloud cover, and zero race insight. Runners were to park in the YMCA lot across from the start/finish of the race. We were able to grab our bibs and swag within minutes and still have time to warm up. In talking to other runners it sounded like we could bring our gear bins to the start, but it was not clearly marked or discussed on the website. We took a risk and grabbed our stuff to bring to the start. We found a small spot to drop our stuff. 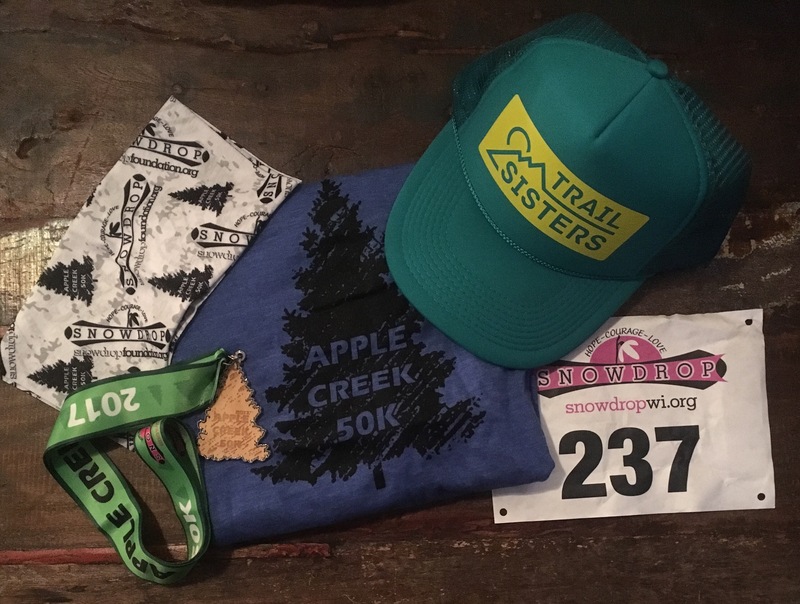 The Apple Creek 50k & Relay proceeds benefit the Snowdrop Foundation of WI. They provides scholarships to college bound pediatric cancer patients and survivors while raising awareness and funding for continued research to cure childhood cancer. To honor the children that had lost their fight against cancer the race director set aside a 1 minute of time after announcements for silence. This powerful moment brought the runners together and was an awesome reminder that we run because we can…this is a gift that should not be taken for granted. Following the minute of silence a runner sang the National Anthem and we were off! With temperatures still chilly we both keep a thin layer on. I wore the Lux Tech Hoodie and Allison wore the Flyte Jacket. These layers were perfect for the 1st loop. As the sun peaked out from behind the clouds the temperatures did get warmer, but remainded in the mid 60s…pure perfection! The Apple Creek course consisted of a 7.75 mile loop that we would be running 4 times. The start of the race took us straight up hill on the residential roads in the area. We ran about half way up the hill and realized that it was better walked than to burn out before we even hit a mile into the race. After about 2 miles on the roads we turned on to the trail. The majority of the loop (5 miles) was on the trail until we turned back onto the roads to circle to the finish. The trail portion fof the course was on the Purdy Farm & Plamann Park trail. There were beautiful views, incredible single track, and a few prairie sections. The variety was refreshing and kept us on our toes. Even after running 4 loops we were still finding new things around every turn that we missed on the previous loops. 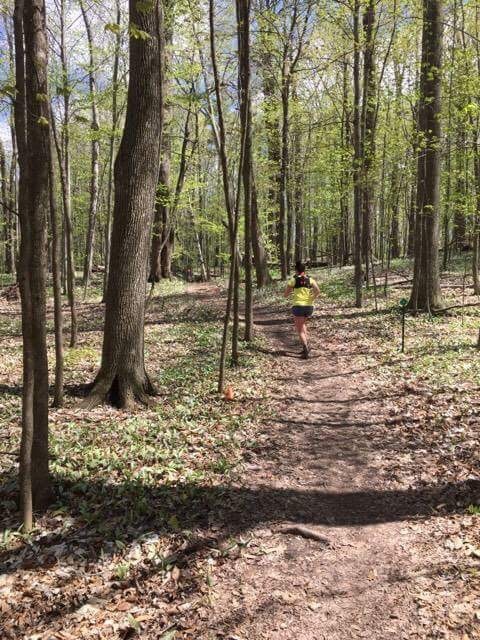 In reading the course description on the Apple Creek 50K Facebook page and talking with other runners who had completed this event last year the course would be a challenge, but was doable. While we were getting our gear out of our cars a runner next to use asked if we were ready to get a little dirty. 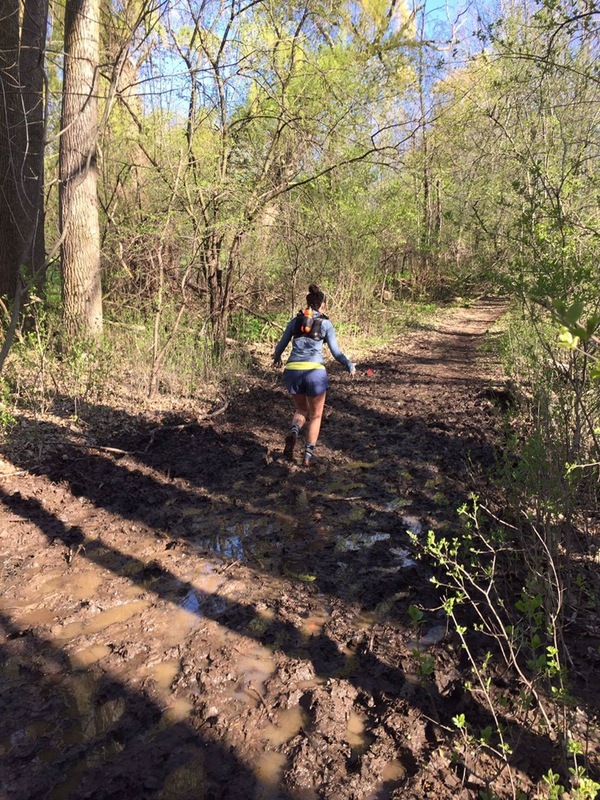 That comes with the territory in trail running so we kind of shrugged it off…that is until we hit our first patch of mud 100 feet onto the trail. Moving through this was an interesting feat. We tried to be graceful at first and find a “good” place to traverse through. Come to find out the hard way there was no “good” way to get through the mud pits. We laughed and joked about how dirty our shoes were after we conquered the pit at the start of the trail. Little did we know that there was much more mud to come. In total there was probably about 1.75 miles of mud on the 7.75 mile loop. This probably does not sound like a lot, but it slowed us down considerably as the day wore on. With each pass the trail got sloppier and the mud deeper. At one point when I stepped into one of the pits I could feel my shoe stay and my foot lifting…not good. We found that if you bound through it you go dirty, but your shoes stayed with you. So bounding we did or at least as best we could. The wet mud got super slippery on the last 2 loops and we had to be careful not to face plant into it. I’m not much for getting dirty (I know that seems counterproductive to my love for trail running which is by its nature a dirty variation of running) and this course was pushing my comfort level to the max. There were 3 total aid stations with 2 on the course and 1 at the start/finish. 2 of the stations were manned and fully stocked and 1 was self-serve. The volunteers at the aid stations and on the course were out-of-this-world amazing. They were friendly and helpful – not to mention funny!!! Allison and I laughed so much throughout the day that my core hurt for several days after. We both went into this event with an open mind and promise to each other to do nothing foolish. If that meant dropping at some point we were both ok with that. Allison has been battling an injury all winter and I was just coming off my Zumbro finish. There was no way that either of us would miss the event, but we realistically wanted to pay each loop by ear and listen to our bodies. After loop #1 we felt good. We kept things low key and worked to learn about the course so we could make a game plan for the remainder of the day. Loop #2 we continued to push through the mud and keep things low key. Finishing loop #2 we knew we would tackle at least one more loop. Mid way into loop #3 both Allison and I were feeling the miles and struggling. We discussed dropping after the 3rd loop and sticking with our original plan of not doing anything foolish. The course cut was 8 hours 30 minutes and we knew that we were going to be cutting it close at the rate we were moving. Coming into the finish area of loop #3 we chatted a little about dropping. We both felt “ok” to do another and grabbed some food then headed back up the giant hill (I swear it good steeper with every loop). We chatted about strategy and decided we needed to work “smarter” not harder this loop to make the cut off and finish. The mud was slowing us down, but we had nice stretches of road that were places we could pick up speed. Now to not come in last. We were at the very back of the pack, which for me is common, especially in a small race. There was one individual behind us which ignited the competitive spirit that often lays deep down inside of me. Allison dubbed him Captain America. The focus to stay moving forward gave us the push we needed to power through the last loop. Back to the race…we finished or 4th loop just like we started, with a smile on our faces! I will never turn an opportunity down to run with Allison, she is the most amazing human being!!! 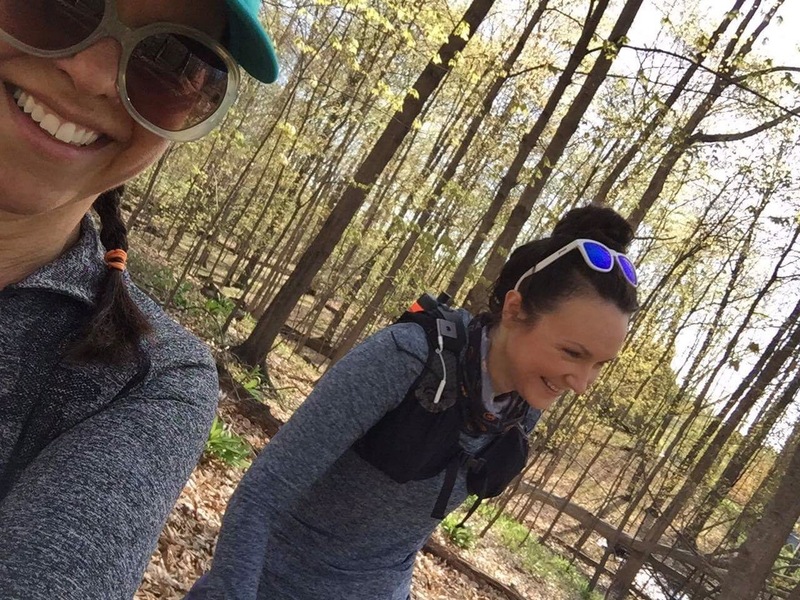 She gets me in ways that I am so appreciative of and our conversations on the course healed my heart and helped get me back to seeing what is important about my running endeavors. Putting up a great time or tackling an uber difficult course do bring me joy, but keeps me coming back for more are the people that I meet and the friendships that I develop. Apple Creek did not disappoint and I would highly recommend it to anyone looking for a fun, unique Spring ultra. On a side note: The swag for this even was exceptional. As solo runners we each received a long-sleeve lightweight hoodie which is bananas soft, a Snowdrop buff, and finisher’s medal. All items were unique and high quality, not what you expect from a small trail event. Kudos to the race director and organizers. On to my next adventure! I’m getting close to completing my goal of 40 by 40…to date I’ve 22 marathons & 10 ultra marathons under my belt. 8 seems feasible as I close in on another birthday in a few weeks. 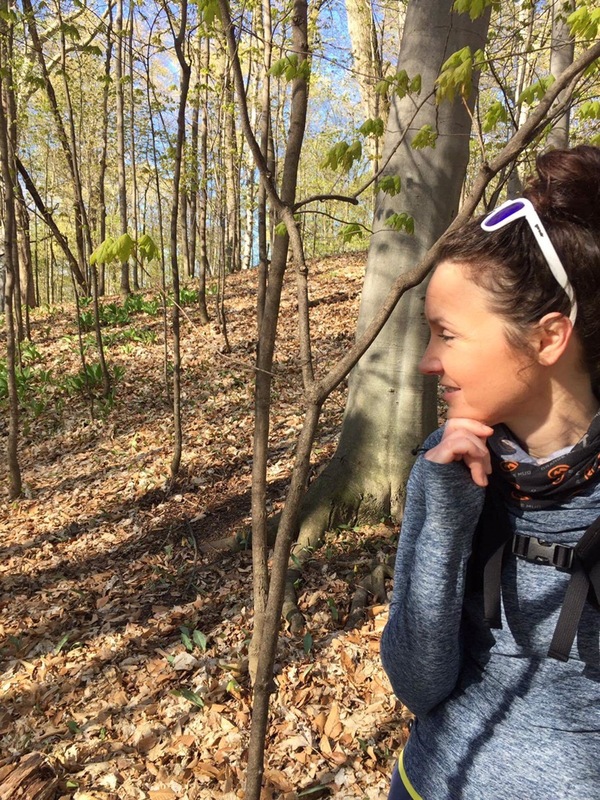 Orange Mud HydraQuiver VP1 – I love this hydration vest! The pack fits like a glove and allows me to carry everything I need. I did not have to check gear drop bags, which was a huge time saver at aid stations. Tailwind Nutrition – I filled my bottle with 2 scoops of Mandarin Orange with 24oz of water. I was able to refill my bottles with more Tailwind at each aid station since it was on course option, BONUS! I did switched to Tropical Buzz (caffeine) on the last loop for a little boost. Oiselle – The temps were in the low 50s to start. I started with Flyout shorts, Wazelle short sleeve, team singlet, and Lux hoodie. I also wore a buff around my neck, a trucker hat, and light gloves. The temps began to rise on the 2nd loop so I shed my gloves and hoodie at base camp, but kept everything else on. Run Gum – I popped this in about 30 minutes before the start of the race while I was enroute to the course. I also carried a pack with me in my hydration vest. I love all the flavors, but typically stick to mint in races. Today I mixed things up and went with Fruit flavor, which paired nicely with the orange Tailwind I was drinking all day. Trail Toes Cream – I slather this stuff on before I put my socks on to prevent hot spots and repeated with every sock change at base camp. I also carried a small container with me and reapplied once to the back of my heels. Altra Superior 3.0 – Race number 2 for these shoes. They worked awesome at Zumbro and again on the Apple Creek trail. The course was not as technical, but did have slippery spots. The shoes gripped and gave me the control I was looking for. Picky Bars – At Zumbro I ate 1/2 a bar every 45 minutes and felt AWESOME! Being that I had success with the 45 minute refuel I stuck with this again. Energy level stayed consistent and stomach did not get upset. Goodr – My go to glasses. I will be adding more colors to my collection as they are released. I currently own the white and pink pair, but need to add orange to the mix!